The TReX blends RC, analog, and serial inputs for a powerful motor control solution capable of delivering a continuous 13 A per motor. The TReX will work right out of the box as an electronic speed control (ESC), but its ability to seamlessly transition between RC/analog and serial control makes it capable of so much more! 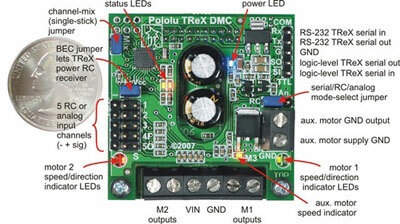 Pololu TReX Dual Motor Controller top view with LEDs, jumpers, and I/O labeled.